Samsung Galaxy A6 is one of the most anticipated launches in the A series along with A6+ and the model has just acquired Bluetooth and Wi-Fi Alliance Certification. 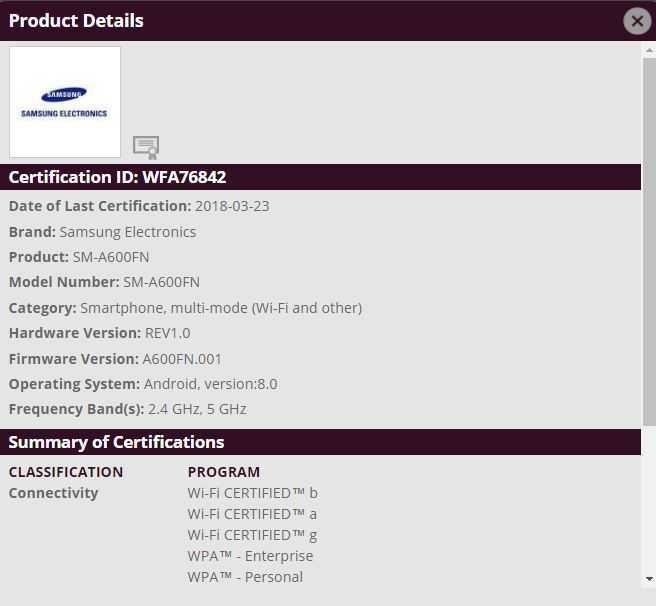 Based on the recent Bluetooth listing, it can been confirmed that the Galaxy A6 will go by the model number SM-A600FN. The screenshot provided in here confirms the model number and the fact that the smartphone is very close to launch date. 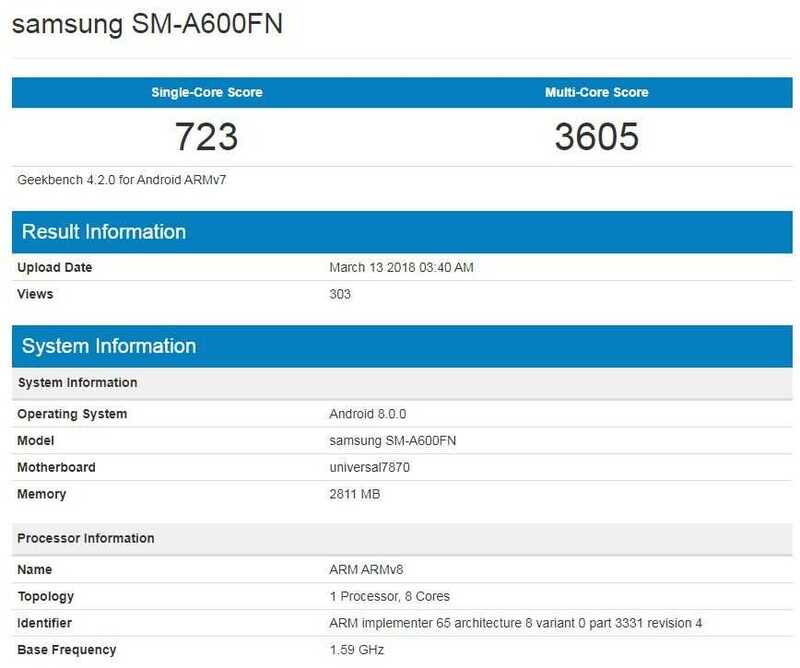 The Galaxy A6 has already been spotted in GeekBench results, along with its counterpart, Galaxy A6+. When everything is put together, it is evident that Samsung will make this model official real soon. The specifications of Galaxy A6 is already known and Samsung might have also planned to launch the A6 Plus along with this upcoming variant. 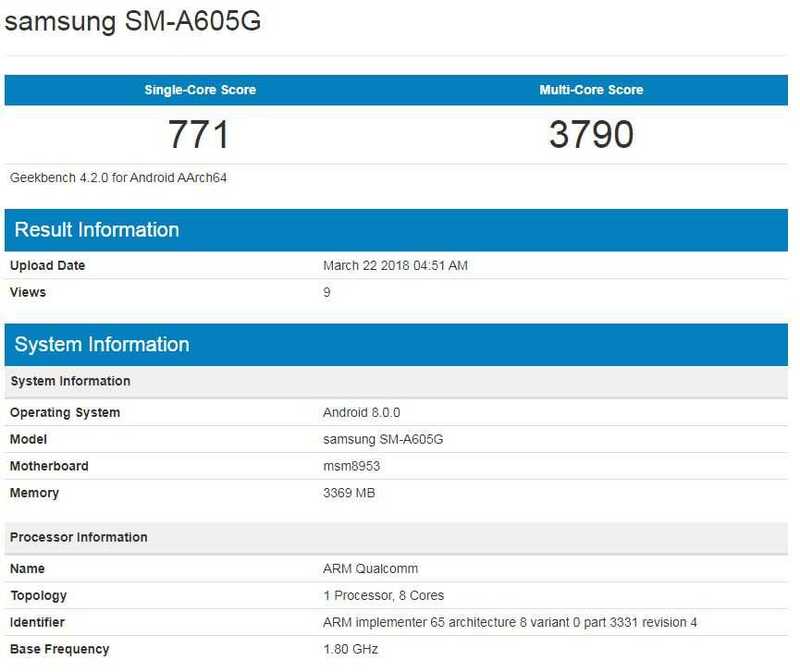 From Geekbench listings, we can understand that Galaxy A6 will be powered by the Exynos 7870 processor. The chipset uses an 8-core Cortex A53 setup combined with Mali-T830 GPU to support your gaming needs. The same processor is already being used in a couple of Samsung models including the Galaxy A3 2107 model and J-series phones. The Galaxy A6 houses 3GB of RAM and runs on Android 8.0 Oreo out of the box making it easier for users who want the latest Android on their smartphone. Galaxy A6 Plus sports a Snapdragon 625 processor (msm8953) with Adreno 506 and has 4GB of RAM. It runs on Android 8.0 Oreo out of the box and design-wise, it looks very similar to the A6. While the GeekBench results provide a quick peek into the specifications, it doesn’t confirm all the details one needs to know. It is expected that Samsung will implement the Infinity Display on A6 and the A6 Plus smartphones. The Bluetooth certification and Wi-Fi certification are available for the A6 but there is still no word on the A6 Plus which has slightly improved specs. We’ll keep you updated when we have more information.